This page is a translated version of the page Esterbrook and the translation is 100% complete. Esterbrook was founded in 1856, but its fountain pen production is concentrated in the period between '40s and '50s. The company specialized in the manufacturing of cheap fountain pens, focusing in the mass market segment. Their pens had steel nibs and ordinary metal finishes. 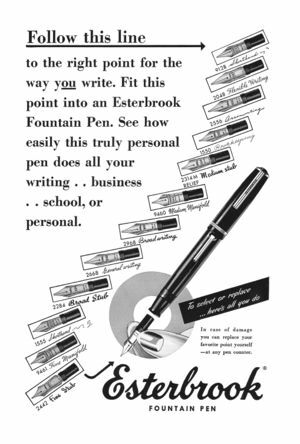 Despite the fact that Esterbrook pens were clearly economic models, they were produced with great care using cheap materials but with good quality manufacturing. The sales of economic models had a great success, including the ability to expand the market to areas hitherto not attained. The Esterbrook pens were extremely robust and functional and produced in a wide variety of patterns and colors. As happened with most of the other fountain pen manufacturers, the company had an inexorable decline when facing the competition from disposable ballpoint pens, ceasing operations in 1971. The company rests, after the fusion with Venus, were bought by Faber Castell in 1973. Esterbrook was founded in 1856 in Camden in New Jersey, by Richard Esterbrook, a Cornish Quaker, who was an immigrant in the United States. He was a stationery, and had assisted to the move from goose pen down to steel nibs. Foretelling a great opportunity in the United States nib market expansion he took five English craftsmen (by the John Mitchell firm of Birmingham) and then start producing steel nibs in the U.S.A. The company operated for the first two years under the name of United States Steel Pen Manufacturing Company; in 1858 it become the Esterbrook Steel Pen Manufacturing Company. The company activities were a great success so that at the end of 1900 Esterbrook was considered, along with Perry & Co. (better known later as Osmiroid), as the largest nib manufacturer of the world. In 1896 the company launched itself in the British market. The first fountain pen was introduced in 1933 corresponding to the first patent for interchangeable nibs. In 1935 the company introduced the Dollar Pen model, called so for its price, just a dollar. The feature that distinguished Esterbrook production was the interchangeable nib unit, but it wasn't the first company offering this feature, that was already used by the Personal Point nibs made by Wahl Eversharp. Differently from Eversharp, Esterbrook used the feature to consent to its clients to easily change their nib as they please, in any moment and not just when buying the pen, helped by the low price of its cheap steel nibs. In 1967 Esterbrook merged with Venus Pen and Pencil Corp., becoming Venus-Esterbrook but the brand became less and less significant, up to the full closure in 1971, when Venus-Esterbrook become part of the Berol Group. In 1973 the rests of the Venus-Esterbrook were acquired by Faber Castell. A site dedicated to the company, a mine of information. An article about the company. An article on J model. An article on Dollar Pen. Brand page on David Nishimura website. Brand page on Bill Acker website. An article on the company's history. An article on nibs numbers. ↑ this date is cited here. ↑ this feature was protected by the patents nº US-1939753 and nº US-1999177 registered respectively in 1933 and 1935, but applied in 1928 and 1933.